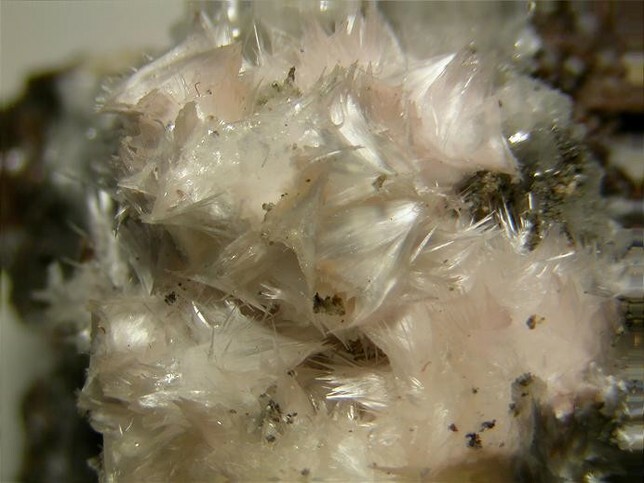 Pickeringite: Mineral information, data and localities. 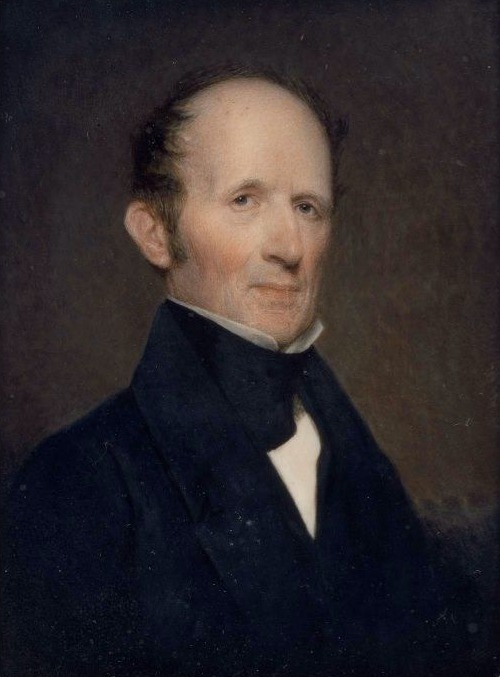 Named by Augustus A. Hayes in 1844 in honor of John Pickering (7 February 1777, Salem, Massachusetts, USA - 5 May 1846, Boston, Massachusetts, USA), linguist, philologist, and President of the American Academy of Sciences. The Mg analogue of Halotrichite. At least a partial series entends toward Apjohnite. Crystals acicular ; distinctly terminated crystals rare. Radial or matted aggregates of hair-like crystals; tufted; spheroidal; as incrustations or effloresences; asbestiform. Larger crystals may be hollow or contain bubbles of liquid or gas. Ferropickeringite An iron-rich variety of pickeringite. Originally reported from Dientnergraben, Eschenau, Lend, Schwarzach, Salzburg, Austria. Kasparite A Co-bearing variety of pickeringite. Originally described from Dubník, Červenica (Czerwenitza), Northern Slanské Mts, Presov Region, Slovak Republic. Manganoan Pickeringite Mn'' may substitute for (Mg,Fe) in at least a partial series toward Apjohnite. 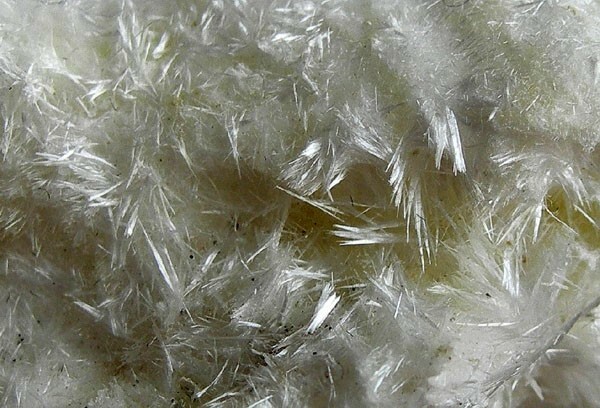 Apjohnite Mn2+Al2(SO4)4 · 22H2O Mon. Kasparite 8 photos of Pickeringite associated with Kasparite on mindat.org. Melanterite 6 photos of Pickeringite associated with Melanterite on mindat.org. Botryogen 5 photos of Pickeringite associated with Botryogen on mindat.org. Fibroferrite 4 photos of Pickeringite associated with Fibroferrite on mindat.org. Chalcanthite 4 photos of Pickeringite associated with Chalcanthite on mindat.org. Copiapite 4 photos of Pickeringite associated with Copiapite on mindat.org. Halotrichite 3 photos of Pickeringite associated with Halotrichite on mindat.org. Cuprian Melanterite 3 photos of Pickeringite associated with Cuprian Melanterite on mindat.org. Magnesiocopiapite 3 photos of Pickeringite associated with Magnesiocopiapite on mindat.org. Slavíkite 3 photos of Pickeringite associated with Slavíkite on mindat.org. 29.7.3.3 Apjohnite Mn2+Al2(SO4)4 · 22H2O Mon. Soluble in H2O, astringent taste. Hayes, A.A. (1844) Description and analysis of pickeringite, a native magnesian alum. American Journal of Science and Arts: 46: 360-362. How, H. (1867) On magnesia-alum, or pickeringite, containing a little nickel and cobalt, occurring in slate in Hants Co. Nova Scotian Institute of Natural Science: 1: 85-87. Dana, J.D. (1868) System of Mineralogy, 5th. Edition, New York: 654 (as Bosjemanite). Roster (1876) Boll. com. geol. Ital. : 302 (as Picroallumogene). Goldsmith, E. (1877) On sonomaite. Proceedings of the Academy of Natural Sciences of Philadelphia: 28: 263-264 (as sonomaite). Doelter (1882) Vulk. Gesteine und Min. der Capverde Inseln: 93 (as Dumreicherit). Darapsky (1887) Neues Jahrbuch für Mineralogie, Geologie und Paleontologie, Heidelberg, Stuttgart: I: 131 (as Sesqui-Magnesia-alaun). Darapsky (1890) Neues Jahrbuch für Mineralogie, Geologie und Paleontologie, Heidelberg, Stuttgart: I: 49 (as Aromite). Uhlig (1912) Centralblatt für Mineralogie, Geologie und Paleontologie, Stuttgart: 723. Zsivy (1920) Zeitschrift für Kristallographie, Mineralogie und Petrographie, Leipzig: 55: 629. Larsen, E.S. (1921) The Microscopic Determination of the Nonopaque Minerals, First edition, USGS Bulletin 679: 41. Schairer, J.F., Lawson, C.C. (1926) On pickeringite from Portland, Connecticut. American Journal of Science: 11: 301-304. Doelter, C. (1927) Handbuch der Mineral-chemie: 4 : 523, 545. Vavrinecz (1929) Magyar Chemiai Folyóirat, Budapest: 35: 1. Hintze, Carl (1930) Handbuch der Mineralogie. Berlin and Leipzig. 6 volumes: 1 [3B]: 4505, 4512. Kokta (1930) Přiroda, Brno: 32: 381. Rutherford, R.L. (1932) An occurrence of pickeringite in Alberta. American Mineralogist: 17: 401-403. Tokody (1933) Földtani Közlöny, Budapest (Magyarhone Földtani Torsulat): 62: 187. Meixner and Pillewizer (1937) Zbl. Min. : 263. Bandy, M.C. (1938) Mineralogy of three sulphate deposits of northern Chile. American Mineralogist: 23: 669-760. Gordon, S.G. (1942) Results of the Chilean mineralogical expedition of 1938. Part VII.—The crystallography of alunogen, meta-alunogen and pickeringite. Notulae Naturae of The Academy of Natural Sciences of Philadelphia: 101: 1-9. Palache, C., Berman, H., Frondel, C. (1951) The System of Mineralogy of James Dwight Dana and Edward Salisbury Dana, Yale University 1837-1892, Volume II. John Wiley and Sons, Inc., New York, 7th edition, revised and enlarged, 1124 pp. : 523-527. Quartieri, S., Triscari, M., Viani, A. (2000) Crystal structure of the hydrated sulphate pickeringite (MgAl2(SO4)4·22H2O): X-ray powder diffraction study. European Journal of Mineralogy: 12: 1131-1138. The following Pickeringite specimens are currently listed for sale on minfind.com. Notulae Naturae of The Academy of Natural Sciences of Philadelphia, # 89 & #92 (1941). Postl, W. & Bernhard, F. (2014): 1996) Alunogen und Pickeringit von einem Forstwegaufschluss im Tal der Schwarzen, Sulm, Gressenberg, Koralpe, Steiermark. P. 140 in Niedermayr, G. et al. (2014): Neue Mineralfunde aus Österreich LXIII. Carinthia II, 204./124., 65-146. WENINGER, H. (1968): Das Cu-Erzvorkommen der Wolfsgruben bei Seiz im Liesingtal (Steiermark), seine Tektonik und Mineralisation. Archiv für Lagerstättenforschung in den Ostalpen, 7, 88-100. Schwaighofer, B. & Müller, H.W. (1979): Pickeringit von der Turrach (Steiermark). Mitteilungen des Naturwissenschaftlichen Vereins für Steiermark 109, 35-37. Ralph L. Rutherford (1932) American Mineralogist, 17, #8, 401-403. Palache, C., Berman, H., & Frondel, C. (1951), The System of Mineralogy of James Dwight Dana and Edward Salisbury Dana, Yale University 1837-1892, Volume II: 620.; Kampf, A.R. ; Mills, S.J. ; Housley, R.M. ; Williams, P.A. ; Dini, M. (2012): Alcaparrosaite, K3Ti4+Fe3+(SO4)4O(H2O)2, a new hydrophobic Ti4+ sulfate from Alcaparrosa, Chile. Mineralogical Magazine 76, 851-861. Palache, C., Berman, H., & Frondel, C. (1951), The System of Mineralogy of James Dwight Dana and Edward Salisbury Dana, Yale University 1837-1892, Volume II: 526. American Journal of Science (1844): 46: 360; Palache et al (1951), Dana's System of Mineralogy, seventh ed., vol. II: 131, 526. Palache, C., Berman, H., & Frondel, C. (1951), The System of Mineralogy of James Dwight Dana and Edward Salisbury Dana, Yale University 1837-1892, Volume II: 622. Breiter K. (1976): Výskyt sulfátů na kvádrových pískovcích svrchní křídy v severozápadních Čechách. Sborník Severočeského musea, Přírodní vědy, roč. 8, s. 99-107. Matýsek D., Raclavská H. (1999) Vznik sulfátové mineralizace na odvalech a její vliv na kvalitu spodních vod v OKR. Uhlí - Rudy - Geologický průzkum, 6, 7-8, 8–16. Velebil, D.: Lokality axinitu v barrandienském proterozoiku vltavského údolí na jih od Prahy. Bulletin mineralogicko-petrografického oddělení Národního muzea v Praze, 2000, roč. 8, s. 180-183. Vorma, A.1966. Rozenite-iron-sulphate tetrahydrate-as fissure coatings in the black schist at Mulo, Pyhäselkä in eastern Finland. Bulletin de la Commission Géologique de Finlande 222, 51-53. D’Angeli, I., Waele, D., Carbone, J., Parise, M., Madonia, G., & Vattano, M. (2017). Secondary Minerals From Italian Sulfuric Acid Caves. In 17th International Congress of Speleology (No. I, pp. 237-241). Australian Speleological Federation Inc.
Franco E. (1962): Su alcuni minerali della Grotta dello Zolfo (Miseno). Bollettino della Società dei Naturalisti in Napoli, 70, 3-7; NHM, London Specimen. Palache, C., Berman, H., & Frondel, C. (1951), The System of Mineralogy of James Dwight Dana and Edward Salisbury Dana, Yale University 1837-1892, Volume II: 620. Ferrari, A., Scaini, G. (1950): Studio di solfati di alluminio e di un metallo bivalente (ferro o magnesio). Per. Mineral., 19, 143-153; Mattioli, V. (1979): Minerali Ossolani. Ed. Arti Grafiche Medesi, Milano, 268 pp. ; Ciriotti, M.E., Preite, D., Blass, G., Appiani, R. (2007): Erratum. Pirrotite a Pestarena. Micro (UK report), 2/2007, 67-68. Campostrini, I., Demartin, F., Gramaccioli, C. M., Russo, M. (2011): Vulcano - Tre secoli di mineralogia. Associazione Micro-mineralogica Italiana, Cremona, 344 pp. GEBHARD G., MEDENBACH O., GEBERT W. (1988): Magnesioaubertit, (Mg,Cu)Al(SO4)2Cl.14H2O ein neues Chlorsulfat von Vulcano, Liparische Inseln. - Der Aufschluss - 39, 2, 97-102. GARAVELLI A., GRASSO M.F., VURRO F. (1996): Mineral occurrence and depositional processes at Baia di Levante area (Vulcano Island, Italy). - Mineralogica et Petrographica Acta - 39, 251- 261. GEBHARD G., MEDENBACH O., GEBERT W. (1988): Magnesioaubertit, (Mg,Cu)Al(SO4)2Cl.14H2O ein neues Chlorsulfat von Vulcano, Liparische Inseln. - Der Aufschluss - 39, 2, 97-102. GARAVELLI A., GRASSO M.F., VURRO F. (1996): Mineral occurrence and depositional processes at Baia di Levante area (Vulcano Island, Italy). - Mineralogica et Petrographica Acta - 39, 251- 261; Campostrini, I., Demartin, F., Gramaccioli, C. M., Russo, M. (2011): Vulcano - Tre secoli di mineralogia. Associazione Micro-mineralogica Italiana, Cremona, 344 pp. Forenza, N., Detomaso G., Zammateo P., Zampedri G. (2005): Minatori, miniere, minerali del Perginese. Brizzi, G. & Meli, R. (1995): La miniera antimonifera di Pereta con un cenno a quella solfo-cinabrifera di Zolfiere in comune di Scansano (GR). Rivista Mineralogica Italiana, 19:, 217-240. G. D'Achiardi, 1910 - Pickeringite (picroallumogene) dell'Isola d'Elba - Atti Soc. Tosc. Sc. Nat., P.V., 19, 23-25. U. Panichi, 1909 - Sulla pirite dell’Elba - Riv. Min. Crist. It., 38: 12-35. Mauro D. (2016): Studio cristallochimico di alcuni solfati di ferro della mineralizzazione a pirite tallifera di Fornovolasco (Alpi Apuane). Tesi magistrale, Dipartimento di Scienze della Terra, Unviersità di Pisa, 137 pp. Hynek, B. M., McCollom, T. M., Marcucci, E. C., Brugman, K. K., & Rogers, K. L. (2013, March). Assessing environmental controls on acid-sulfate alteration at active volcanoes in Nicaragua: applications to relic hydrothermal systems on mars. In 44th Lunar and Planetary Science Conference, March (pp. 18-22). Hynek, B. M., McCollom, T. M., Marcucci, E. C., Brugman, K. K., & Rogers, K. L. (2013, March). Assessing environmental controls on acid-sulfate alteration at active volcanoes in Nicaragua: applications to relic hydrothermal systems on mars. In 44th Lunar and Planetary Science Conference, March (pp. 18-22). ; Hynek, B. M., McCollom, T. M., Marcucci, E. C., Brugman, K., & Rogers, K. L. (2013). Assessment of environmental controls on acid‐sulfate alteration at active volcanoes in Nicaragua: Applications to relic hydrothermal systems on Mars. Journal of Geophysical Research: Planets, 118(10), 2083-2104. Siuda, R. (2004) Wieściszowice. Otoczak, No.31, 58-65. Mochnacka, K., Oberc-Dziedzic, T., Mayer, W., Pieczka, A. (2012) Ore mineralization in the Miedzianka area (Karkonosze-Izera Massif, the Sudetes, Poland): new information. Mineralogia Polonica, 43:(3-4), 155-178. European Journal of Mineralogy: 12: 1131-1138. Bortnikova, S. B., Bessonova, E. P., Gavrilenko, G. M., Vernikovskaya, I. V., Bortnikova, S. P., & Palchik, N. A. (2008). HYDROGEOCHEMISTRY OF THERMAL SOURCES, MUTNOVSKY VOLCANO, SOUTH KAMCHATKA (RUSSIA). In Proceedings of the 33rd workshop on geothermal reservoir engineering, Stanford University, Stanford, SGP-TR-185. ; Bortnikova, S. B., Bortnikova, S. P., Manstein Yu, A., Kiryuhin, A. V., Vernikovskaya, I. V., & Palchik, N. A. (2009, February). Thermal springs hydrogeochemistry and structure at North-Mutnovskoe fumarole field (South Kamchatka, Russia). In Proceedings, thirty–fourth workshop on geothermal reservoir engineering. Stanford University, Stanford, CA, pp SGP-TR-187. Frias, J. Martinez; Guinea, J. Garcia; Ruiz, J. Lopez (1994): Modeling of the geothermal processes associated with the Herrerias silver deposit (southeast Spain). Acta Universitatis Carolinae, Geologica 1994 (volume date 1992), 169-181. Romero, A., I. Gonzalez & E. Galan (2006): The role of efflorescent sulfates in the storage of trace elements in stream waters polluted by acid mine-drainage: the case of Peña del Hierro, southwestern Spain. Can. Mineral. 44, 1431-1446. Romero, A., I. Gonzalez & E. Galan (2006): The role of efflorescent sulfates in the storage of trace elements in stream waters polluted by acid mine-drainage: the case of Pena del Hierro, southwestern Spain. Canadian Mineralogist 44, 1431-1446.
ⓘ Sultana open pit (Sultana Mine) ? Stalder, H. A., Wagner, A., Graeser, S. and Stuker, P. (1998): "Mineralienlexikon der Schweiz", Wepf (Basel), p. 215. Stalder, H. A., Wagner, A., Graeser, S. and Stuker, P. (1998): "Mineralienlexikon der Schweiz", Wepf (Basel), p. 303-304. Stalder, H. A., Wagner, A., Graeser, S. and Stuker, P. (1998): "Mineralienlexikon der Schweiz", Wepf (Basel), p. 304. Anthony, J.W., et al (1995), Mineralogy of Arizona, 3rd.ed. : 328. Galbraith, F.W. & D.J. Brennan (1959), Minerals of AZ: 62. Williams, S. & Cesbron, F. P. (1995). Wupatkiite from the Cameron uranium district, Arizona, a new member of the halotrichite group. Mineralogical Magazine, 59, 553-556. Grant, Raymond W., Bideaux, R.A., and Williams, S.A. (2006) Minerals Added to the Arizona List 1995-2005: 9. Grant, Raymond W., Bideaux, R.A., and Williams, S.A. (2006) Minerals Added to the Arizona List 1995-2005: 4.; Hanson, S. L., A. U. Fastner, W. B. Simmons (2008) Mineralogy of the Fumerole deposits at Sunset Crater Volcano National Monument, Northern Arizona. Rocks & Mnerals 83:6 pp 534-544. Anthony, J.W., et al (1995), Mineralogy of Arizona, 3rd.ed. : 264; Anthony, J.W. & W.J. 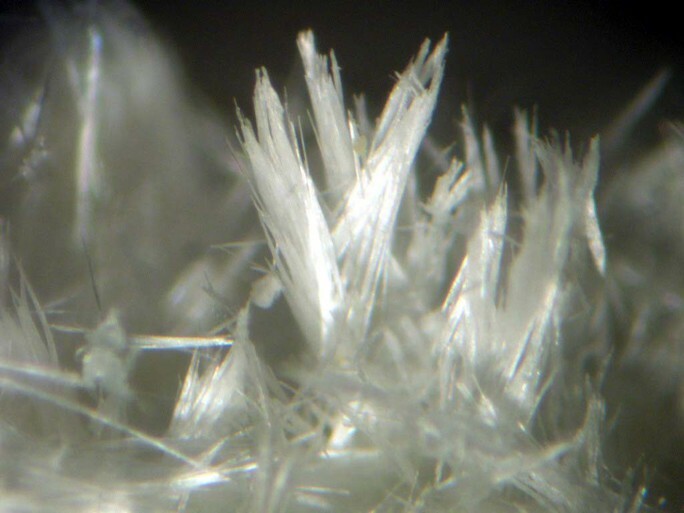 McLean (1976), Jurbanite, a new post-mining aluminum sulfate mineral from San Manuel, AZ, Am.Min. : 61: 1-4. Murdoch, Joseph & Robert W. Webb (1966), Minerals of California, Centennial Volume (1866-1966): California Division Mines & Geology Bulletin 189: 288. Pemberton, H. Earl (1983), Minerals of California; Van Nostrand Reinholt Press: 264. Roberts, Rapp, & Weber, 1974. Encylopedia of Minerals; Frost, Raymond L. and Locke, Ashley J. and Martens, Wayde N. (2007) Thermal analysis of halotrichites. Thermochimica Acta 459(1-2):pp. 64-72. Murdoch, Joseph & Robert W. Webb (1966), Minerals of California, Centennial Volume (1866-1966): California Division Mines & Geology Bulletin 189: 288; Pemberton, H. Earl (1983), Minerals of California; Van Nostrand Reinholt Press: 264. Dr. Housley, R., 2018, pers. comm. Dr. Housley, R., pers. coll. Palache, C., Berman, H., & Frondel, C. (1951), The System of Mineralogy of James Dwight Dana and Edward Salisbury Dana, Yale University 1837-1892, Volume II: 526; Allen, Eugene T. & Arthur L. Day (1927), Steam wells and other thermal activity at “The Geysers,” California: Carnegie Institute Washington Publication 378: 45; Pemberton, H. Earl (1983), Minerals of California; Van Nostrand Reinholt Press: 264. Sullivan, Earle C. (1985): History and Minerals of Old Mine Park. Second Edition, Revised and Expanded. Trumbull Historical Society, Inc.
Januzzi, Ronald E. (1976), Mineral Localities of Connecticut and Southeastern New York State. Taylor Associates/Mineralogical Press, Danbury. Palache, C., Berman, H., & Frondel, C. (1951), The System of Mineralogy of James Dwight Dana and Edward Salisbury Dana, Yale University 1837-1892, Volume II: 526; Minerals of New Mexico 3rd ed. Hammarstrom, Jane M. Seal II, Robert R., Meier, Allen L. and Jackson, John C. (2003) Weathering of Sulfidic Shale and Copper Mine Waste: Secondary Minerals and Metal Cycling in Great Smoky Mountains National Park, Tennessee, and North Carolina, USA; Environmental Geology: 45: 47. Carlson, E.H. (2002) Ohio mineral locality index, part 2 – concretions, and miscellaneous occurrences. Rocks and Minerals: 77(5): 312. Gold, D. P. (2006, October). Skytop: a Case History of Highway Construction Through a Sulfide Vein Deposit in Centre Country, Pennsylvania. In 2006 Philadelphia Annual Meeting. Collected and analyzed by Joy Desor.